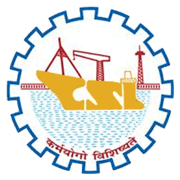 Cochin Shipyard Limited Recruitment 2019 - Apply Online for 40 Project Officer & SPO Posts in Cochin Shipyard Limited, Mumbai, Maharashtra, Kolkata, West Bengal, Kochi, Kerala on Contract Basis. Online Applications are invited by Cochin Shipyard Limited from 30 Mar 2019 to 24 Apr 2019 for 40 vacancies. Any of the divisions/ departments in CSL (or at any of its project sites like Mumbai, Kolkata, International Ship Repair Facility (ISRF) Kochi, Andaman etc). 02 Degree in Mechanical/ Electrical/ Electronics/ Civil Engineering with 60% of marks from a recognized University. Minimum of four years post qualification experience/ training in a Shipyard/ Port/ Marine Engineering Training Institute/ Heavy Engineering Company. 20 Degree in Mechanical/ Electrical/ Electronics/ Civil/Instrumentation Engineering with 60% of marks from a recognized University. Electrical/ Electronics/ Civil/ Instrumentation Engineering with 60% of marks from a recognized University. Minimum of two years post qualification experience/ training in a Shipyard/ Port/ Marine Engineering Training Institute/ Heavy Engineering Company. Proficiency and experience of working in a computerized environment would be advantageous. 02 Engineering Degree in Computer Science/ Information Technology or Masters Degree in Computer Science/ Computer Application/ Information Technology with 60% of marks from a recognized University. Eligible candidates may apply online at Cochin Shipyard Limited's website (direct link is given below) from 30 Mar 2019 to 24 Apr 2019. After applying online applicants need to send the print out of online application form along with self-attested copies of certificates towards proof of age, caste, educational qualification, experience, disability (if any), etc. by Registered post / Courier ONLY to “The Chief General Manager (HR & Training), Cochin Shipyard Ltd, Perumanoor P.O, Kochi-682015”. The application with all relevant documents should reach on or before 30 April 2019. The envelope containing the online application print out and certificates should be superscribed on top as “Application to the post of Senior Project Officer (Discipline)/ Project Officer (Discipline) on a contract basis, Registration Number……………..". 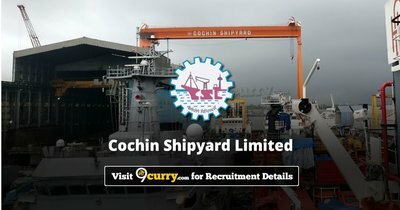 Cochin Shipyard Limited Recruitment 2019 - Apply Online for 50 Ship Draftsman Trainee Posts in Cochin Shipyard Limited, Kochi, Kerala on Contract Basis. Online Applications are invited by Cochin Shipyard Limited from 17 Apr 2019 to 02 May 2019 for 50 vacancies. Cochin Shipyard Limited Recruitment 2019 - Walk in for Project Officer Posts in Cochin Shipyard Limited, Kolkata, West Bengal on Contract Basis. Candidates are invited by Cochin Shipyard Limited to attend walk-in-interview to be held on 26 Apr 2019 09:00 AM for 2 vacancies.